WRR Classical 101.1 in Dallas interviewed Met. Hilarion the afternoon before his concert. In the interview he discusses how he composes the music, his 20 year hiatus from composition, and more. It’s an engaging interview that reveals some of the personal side of Met. Hilarion. Earlier that day Met. Hilarion met with former President George Bush. Source: mospat.ru. HT: Byzantine, TX. 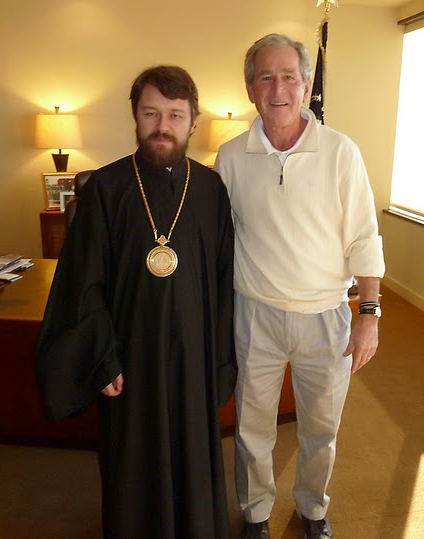 On the morning of February 11th a meeting of Metropolitan Hilarion and former U.S. President George W. Bush was held. They spoke for over an hour. The two sides exchanged views on a wide range of issues. In particular, the DECR chairman shared his vision for the inter-Christian dialogue, stressing the need to work together representatives of different Christian denominations in the preservation of traditional moral values. To commemorate the meeting the chairman of the DECR gave former President George Bush his book “Orthodox Christianity: The History and Canonical Structure” in English and a commemorative box with an image of the Kremlin. I’ve been a fan of classical music from my early teen years on, I never would have thought any clergy in our church would have composed anything other than perhaps an arrangement of old hymns or other music for use in services. Now, I do look forward to music in services, and appreciate it greatly. But to see such credible and new works with such general reach intended to stand on their own, and by a church official no less! Well done, really impressive. I wonder what reception it might get from symphony conductors and university choral professors. Plenty of major municipal and regional symphonies do at least one work combined with major choir annually. Even our little town just did Mozart’s Requiem last month, next year Britten’s War Requiem at about the same time. Really brings people in exceeding our attendance estimates (and in these days for a professional symphony orchestra, with paid players and staff, that’s saying something I can tell you). Well, I’m no big fan of Bush. Personality, on the immirgation front he believes that you can buy votes, and Bush never thinks that hispanics vote more Democratic than whites because their poorer, it doesn’t have to do whether Republicans are in favor or against immirgation reform that Bush wanted doesn’t effect hispancis. And yes, because people are social conservatives doesn’t mean that they are fiscal conservatives, Bush never understood this. My mother listens to Laura Inghram and Bush would not invite her to see Pope Benedict since she was critical of Bush on immirgation. i think this was petty on Bush’s part. On the other hand, I don’t go as far as the left against Bush-enemy number 1. And what, pray tell, does any of the Bush commentary have to do with Metropolitan Hilarion’s visit, or his message regarding all Christians standing together in support of moral imperatives? Hey trey, the Bush commentary is a heck of alot better than the president of the episcopal assembly comparing Obama to Alexander the Great! Listen to the Homily “No one has ever seen God” – it may provide insight as to what Met. Hilarion was doing here.